Normally, if you have a properly installed pool and keep up regular maintenance, you seldom worry about draining the water. But, sometimes, weather and heavy use affect your water condition regardless of how well you maintain it. Issues like heavy rain, chemical imbalance, repairs, and other factors may necessitate a need for draining some water. If you haven’t drained your pool for several years, you may have Total Dissolved Solids level, or TDS, in your pool. When the TDS level gets high, mineral stains start developing on the pool floor and walls. If the Total Dissolved Solids level accumulates too much, the pool’s surface starts deteriorating. Whether your pool suffers from TDS or it needs repairs, draining the pool might become necessary. In many cases, you can save wear and tear on the pool pump by draining the water manually. You could empty the pool water one bucket at a time, but doing so is back-breaking work. An easier way to empty the pool is by siphoning the water out using a garden hose. If the water exit point is lower than the hose end pulling the pool water out, siphoning is very efficient. In this article, we give you a complete guide on using a garden hose for draining any pool type. 1.3.1 Attach the unsubmerged section of hose to the faucet. Turn on a full water stream, letting move through the hose. After you see the water exiting the submerged hose, about 30 seconds, the hose is full. Before beginning the draining process, there are a few important considerations for both style pools. Choose the location for the hose that offers good drainage where the exit point is lower than the water level. You need a plan for where the wastewater should dump. Carefully consider the drainage area for its ability to handle a large water volume. You don’t want wastewater going onto adjacent property or into storm drains, or public streets. Some local government regulations may require running pool water into a sewer system. In this case, you need to siphon the water into a sewer cleanout or house water drain. Turn off the pool filter and locate a good spot for draining the wastewater. Make sure the drainage area has a location that won’t cause any damage. Place the hose end in the water and slowly feed until hose fills with water and fully submerges. Leave enough of the hose unsubmerged and out of the water to reach the wastewater disposal area. Place an endcap on the hose to keep the water from draining back out. Weight the hose end down with a brick or other heavy object that won’t tear the liner of an above ground pool. A ¾ – inch hose works well for siphoning off the water. The hose length depends on the distance to the wastewater dumping area. Attach the unsubmerged section of hose to the faucet. Turn on a full water stream, letting move through the hose. After you see the water exiting the submerged hose, about 30 seconds, the hose is full. If you can’t get the water flowing through the submerged hose, you can do a manual siphon. Once you have the hose moved to the drainage area, place your mouth over the end of the hose. 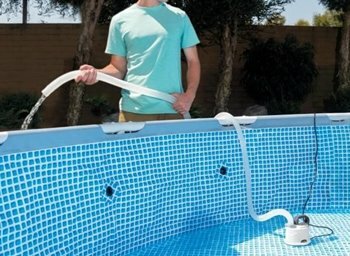 Begin the siphon by sucking the air from the hose until you feel the pool water against your mouth. Place the hose end on the ground, making sure the water continues flowing in a steady stream. The water pressure of the pool helps push the water out the hose. With the end of the hose lower than the pool’s water level the water easily drains out the hose. Even though the hose goes up and over the pool edge, the water continues flowing. The hose starts filled with water and the suction created pulls it over the edge and down the line. The materials and services for maintaining both an inground and aboveground pool costs money. Finding ways to save money is important and using a garden hose for draining is a great cost saver. Draining the pool yourself over hiring a service technician makes good sense. The steps for draining an inground pool are similar to draining an aboveground pool. Most importantly, you want to check your local ordinances to find out where you should dispose of the wastewater. Also, some inground pumps and filters may require additional steps before using the hose method for draining water. Always check the manufacturer’s instructions and warnings. Turn off the pool filter and automatic fill valve. The auto-fill valve is a part of the automatic water filling system found in most commercial and residential in-ground swimming pools. With an inground pool, you need to locate the pool’s clean-out port. You normally find this port in the ground in the front yard close to a water spigot. While you can place the hose end on the ground for draining, it’s best to use the clean-out port. After using a hose in a swimming pool clean-out port, it becomes contaminated. Do not use the hose for anything involving drinking, food sources, or cleaning. Unscrew the cap to open the clean-out port. Place the garden hose end inside the clean-out port making sure it’s in far enough to keep from falling out. 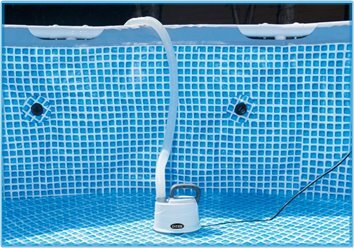 Thread the garden hose back around the house, to the pool and attach the hose end to a submersion pump. 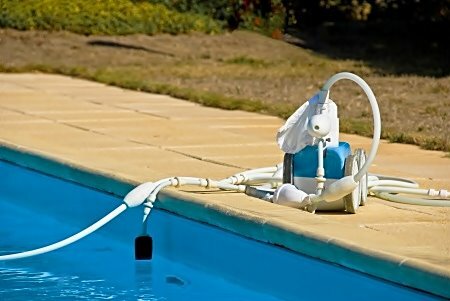 Place the pump and hose near the pool drain in the deep end of the pool. The pool should begin draining. Check the clean-out port in the front yard to verify the water is draining into the port and not out on the front lawn. If it’s not working correctly, stop the draining and adjust the hose. If it still is not draining properly, you may need a plumber. Once the water drains out, clean the pool and make any necessary repairs. Refill or cover the pool if you need more time for repairs. Sunlight damages the pool surface when not filled with water. After refilling the pool, it takes about one week for proper chemical balance before it is safe for swimming. If you don’t need to use the clean-out port for draining the water, follow the aboveground instructions listed above. However, be careful of where and how you drain the waste water. Using the clean-out port is normally the best idea regardless of how much water you need to drain.